Charlie is a young girl who loves horses, and so is delighted when she accidentally buys a racehorse at an auction. 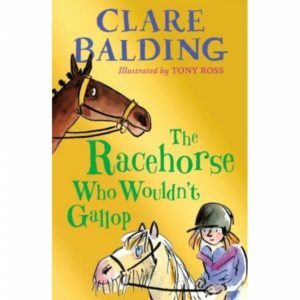 Her family are not so happy, and there are more problems when Charlie finds out the racehorse isn’t very good at racing. The book is interesting in its focus on a young girl who doesn’t quite fit in with other girls her age, and who gets on better with her brothers, but feels she can’t fully join in with them because she is a girl also. The novel touches on issues of body positivity, as Charlie celebrates what her body can do, rather than how it looks. Charlie is a brave and capable heroine in the world of racing that is usually male-dominated.